Versatile. NoCry's Forestry Helmet is made to protect your head from falling branches, objects and debris while trimming trees and brush, doing construction work, landscaping, and working on other projects where head, eye and ear protection is important. It's how you protect your noggin while you're out loggin'. Assembly takes up to 5 minutes. Product like forestry helmets can be quite difficult to assemble, so we've done our best to create easy-to-follow assembly instructions that are included in the package. It takes just a few minutes, then you're ready to get to work. Easily adjustable for any needs. With a few easy-to-make adjustments, this Forestry Helmet can be configured six different ways for use on different projects: Head protection/hard hat only, head protection + polycarbonate visor, head protection + mesh visor, head protection + ear muffs, head protection + ear muffs + polycarbonate visor, head protection + ear muffs + mesh visor. No additional purchases necessary. The package includes everything you'd need to get the most out of this helmet - a hard hat, suspension webbing, a pair of ear muffs, 1 mesh visor, and 1 clear face shield. We stand behind every item we make. If there's ever an issue with your helmet or accessories, we'll make it right by replacing them for free or giving your money back. 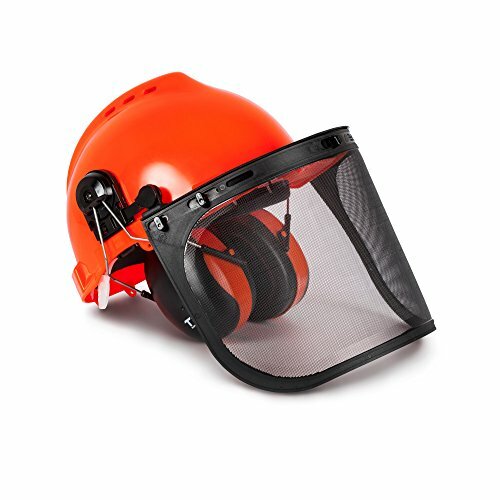 If you feel ready, order your NoCry NoCry 6-in-1 Industrial Forestry Safety Helmet and Hearing Protection System now. HARD HAT EYE AND EAR PROTECTION. 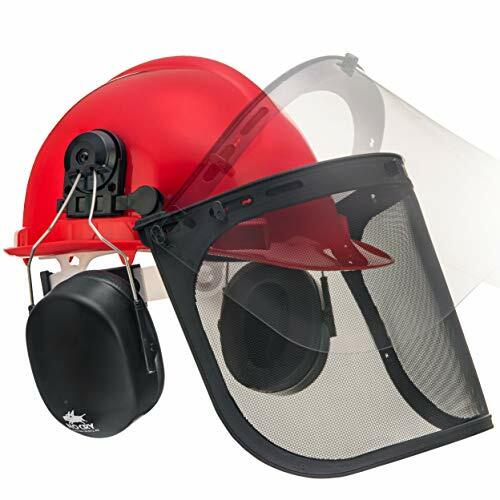 NoCry's Professional Forestry Helmet comes with an adjustable mesh visor for protection from flying debris, a polycarbonate face shield for extra eye protection, and a pair of adjustable 25.9 dB SNR earmuffs that drastically reduce noise for hearing protection. USE IT ANYWHERE. While this lightweight hard hat is made for professional forestry work, it also guards against injury while using chainsaws, hedge trimmers, shrub trimmers, bush-cutters and other tools that require face, ear, eye and head protection while you work. FULLY ADJUSTABLE TO FIT ANYONE. The internal headband adjusts easily to fit heads measuring from 21 17/64 (54 cm) to 24 13/32 inches (62 cm) in circumference. The visors can be set at different angles and depth positions, and ear protection can be rotated to the back of the helmet, allowing for the helmet to be configured in six different ways depending on your project's needs. SAFETY RATED AND APPROVED. ANSI and CE Approved. This helmet and parts have been tested and evaluated for safety and given the Z89.1-2003 ANSI rating, the professional standard for head protection. 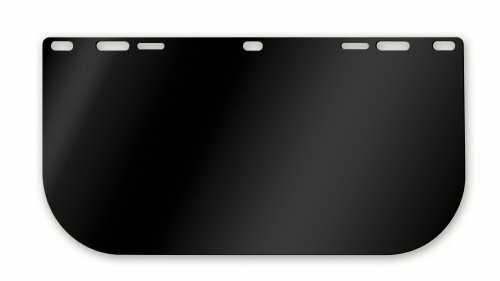 Clear polycarbonate shield. Size 8" x 15.5" .040 thick. Fits E13, E15, E16, E16R, E17, E18, E19, E20 and 5000 Visor Carrier. A combination headgear and faceshield safety system. Includes H8A ratchet headgear and WP96 polycarbonate faceshield. Adjustable, thirteen position ratchet suspension. 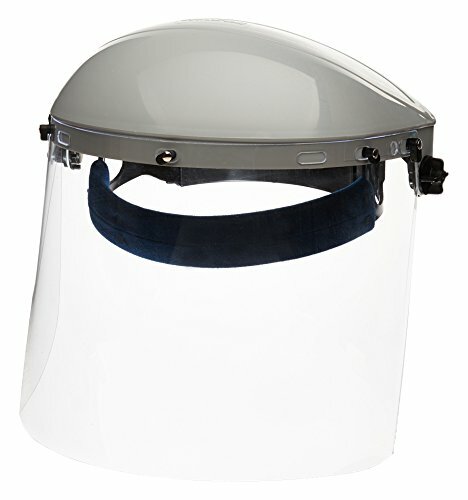 Clear, molded faceshield provides high impact protection. Color: Clear. Material: Polycarbonate. 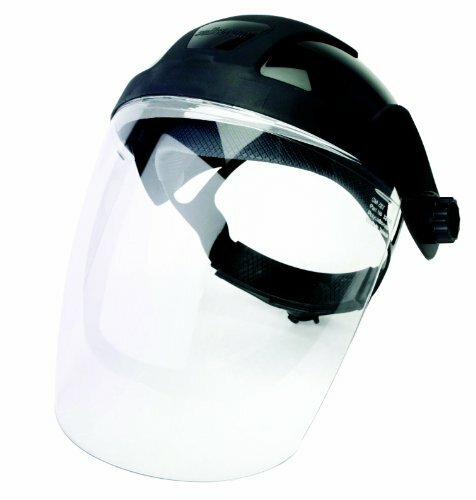 Product type: Headgear/faceshield/window/visor. Recommended application: Chipping, chiseling, drilling, grinding, machining, power fastening, riveting, sanding, sawing. Recommended industry: Automotive, construction, general manufacturing, mining, oil and gas. Measures 14.25" height by 9" width. Five position crown strap. Made of polycarbonate. Meets the requirements of ANSI Z87.1-2003. 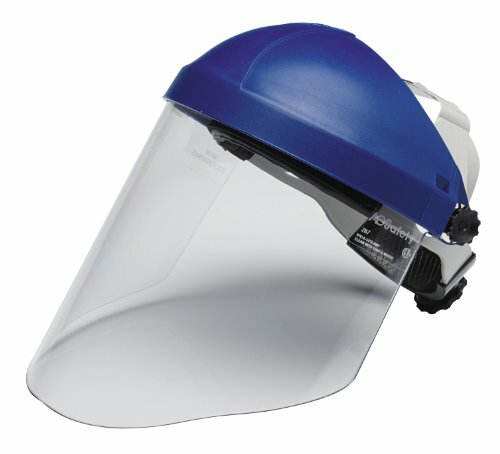 Helps offer durable head and face protection to workers in metalworking, utilities, wood working, and many other industries. 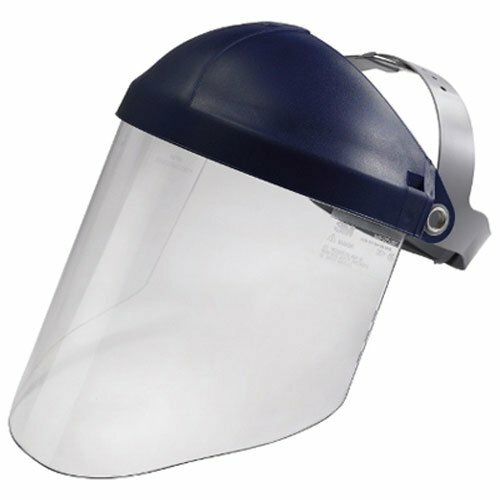 Molded polycarbonate faceshield provides impact protection; Includes H8A ratchet headgear and WP96 polycarbonate faceshield. The Zenport FS825 adjustable face shield with mesh visor protects the face from flying wood chips during woodcutting and chain sawing. 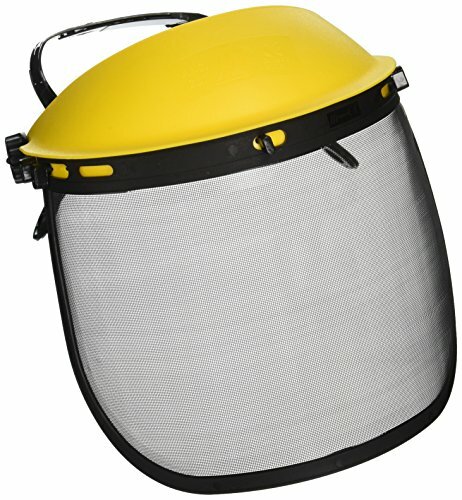 The mesh allows for ventilation to keep your face cool as you work. Ideal for landscapers, this breathable mesh face mask is suitable protection for a variety of light duty jobs. One size fits all. 6.Keeps your face, nose and lungs free from dust! Very light weight and durable. Face mask face shield, Includes Reusable Frame with Quick Shield Changes (Comes with 10 Shields). 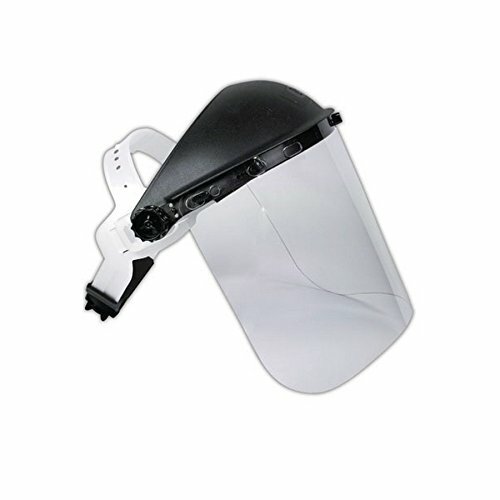 Full Facial Protection from spray and splatter, includes a top visor shield. 3M professional face shields are engineered to be comfortable, convenient, and functional to help keep professionals and DIYers safe. Designed to help protect the eyes and face against certain impact and chemical hazards. With 3M professional face shields, we've got you covered, so you can focus on getting the job done right. 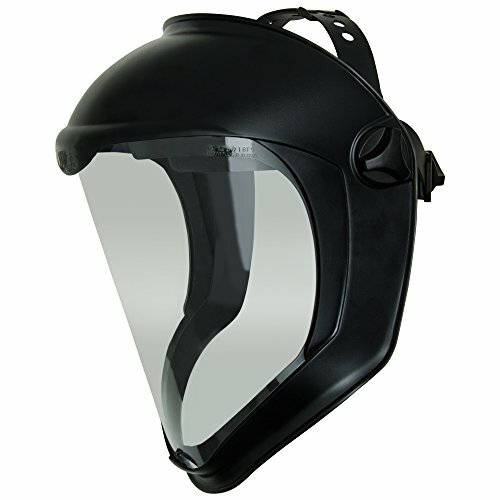 The magid IHG7RK8154 headgear and Faceshield features a black, impact-resistant polypropylene headgear with ratchet side adjustments and a Clear 8 inch x 15.5 inch x .040 inch polycarbonate Faceshield with universal hole patterns. The impact resistant Faceshield component makes for excellent use in outdoor applications given its excellent weatherability, UV resistance and chemical tolerance characteristics. The magid IHG7RK8154 headgear and outdoor Faceshield meets ANSI standard Z87.1. Perfect for use in industries,safe and practical.Breathable and comfortable to wear. VELCRO DESIGN:Convenient to replace the glass.In front of the perspective is curved glass,clear view. The mask has the receiver on each side.In the case of full seal, you can hear the outside sound clearly. VENT DESIGN:Make sure that it does not affect breathing during long working hours. Elastic design is used inside.Effectively prevent dust and fine dust from entering. 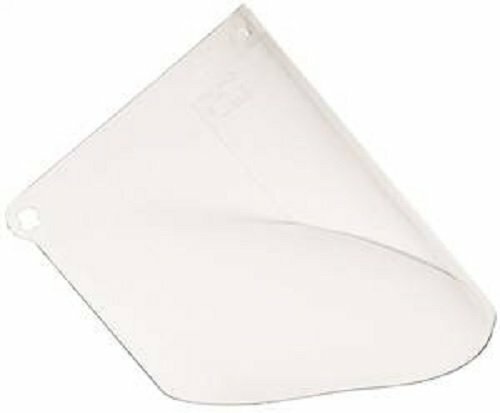 Use to replace broken or cracked faceshield covers; designed to fit the patented 3M TEKK protection deluxe and professional faceshield systems; made of a pre-molded clear polycarbonate; high in strength; meets the ANSI Z87.1-2009/CSA Z94.3-2005 requirements. 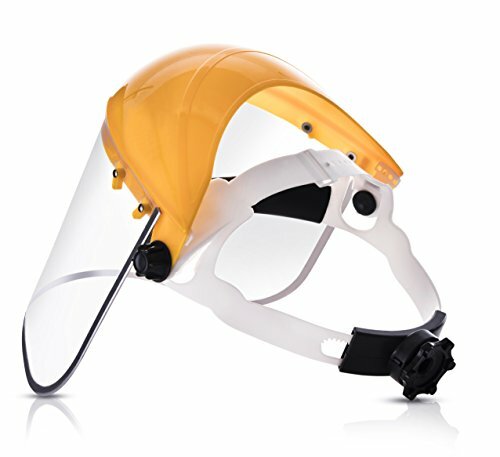 MCR Safety 181540 polycarbonate Clear face shields give lightweight and durable protection from chemical splashes and debris while working. Shields meet or exceed ANSI Z87.1 safety standards and will work with most Manufacturer's cam lock headgear. Shields are protected during transit with film to be removed before use. Each is 8 inches by 15.5 inches and 5-hole punched. The Omni shield's next generation design is the modern answer to impact protection. The high density contoured lens is over 1. 9 times thicker than a traditional face shield. This added protection is coupled with multi-axis headgear to enhance comfort and provide a personalized fit. 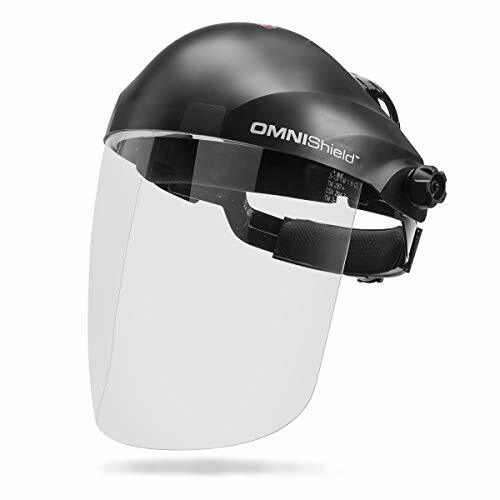 Available in various styles and compatible with most hard hats, the Omni shield is the professional s choice for face protection. IMPACT PROTECTION - High density clear polycarbonate lens is 190% thicker than a standard face shield (0. 077" vs 0. 040") for enhanced protection. SUPERIOR COMFORT - Cushioned front and back headband eliminates pressure points and evenly distributes face shield weight. Unique shell & lens profile contours to the head and neck to deflect impacts. ADJUSTABLE FIT - The modern headgear allows you to adjust face to lens distance, tightness / looseness, top of head fit and more to ensure comfort. VERSATILITY - The Omni shield headpiece is compatible with multiple lens types as well as hard hat adapters for use in industrial environments. Certified to meet Z87. 1, CSA Z94. 3, EN 166 and AS/NZS 1337. 1 compliance standards. 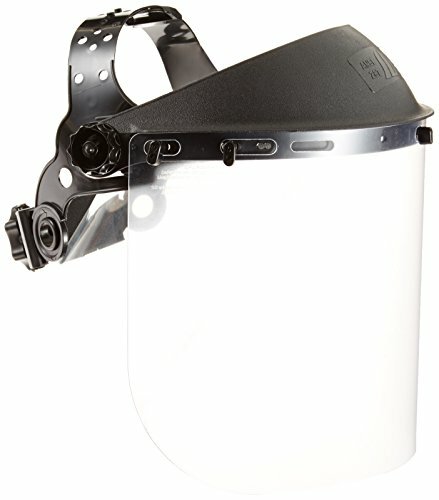 Clear Full Face Shield Visor Mask - Face And Head Coverage- Ideal For Automotive, Construction, General Manufacturing, Mining, Oil/Gas Uses - By Katzco Keep your face and eyes safe from flying objects and more with the Katzcos face shield. 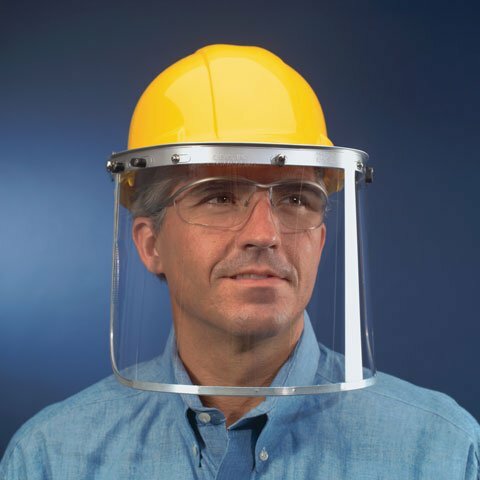 Ideal for rugged jobs, and designed to be worn with safety goggles, The Katzco face shield features an extremely lightweight and balanced design for all-day comfort. It's well suited for workers who are exposed to falling or flying objects, Impacts, chemical splashes, welding infrared radiation, The headgear and visor are highly adjustable, allowing you to achieve a custom fit. You don't have to get stuck when you are in the middle of cutting. 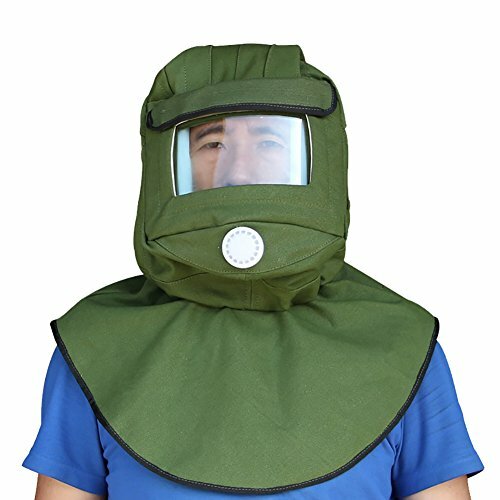 Grinding any heavy duty stuff like cutting down trees it will protect your eyes, face, head, chin, and neck Molded face shield provides high impact protection. One-size-fits-most safety face shield. All-in-one set comes with necessary headgear No more taking off your shield to adjust; put the mask on, tighten/loosen to your desired size Spend your money for the good ones katzco will get you satisfied get yours today Try it, totally risk free! If for any reason you decide you don't like it, just send a simple email and get a full refund! Absolutely no questions asked, so you have nothing to lose, click add to cart now!  WHAT YOU GET: Full Face Visor Mask, Provides more complete coverage than typical face shields. 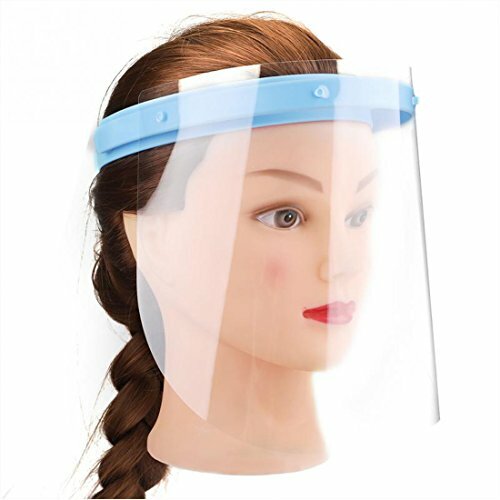 - Clear face shield allows work to be done without the dangers of getting flying objects in your eyes or face.  COMFORTABLE: This product can be worn comfortably with most goggles and respirators and includes a breathable, removable, washable headband and comfortable cell foam on the back of the headgear. 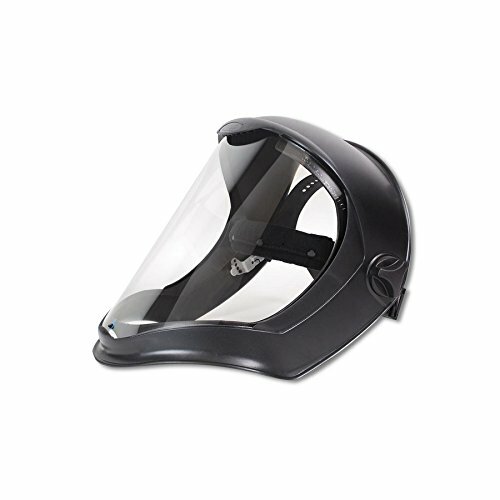 The visor can be easily replaced allowing you to swap in a visor with a different tint, and helping to extend the life of the face shield. 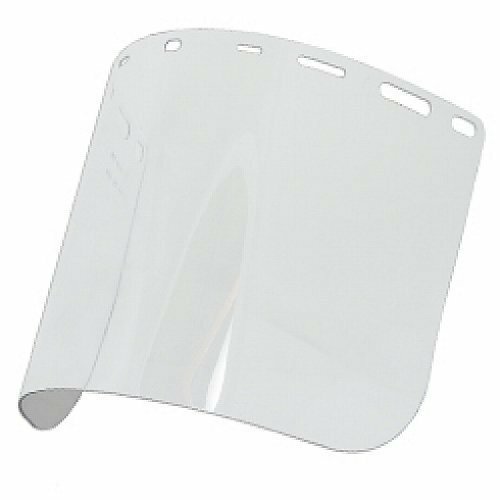  SATISFACTION GUARANTEED: Katzco will make sure that you will be satisfied with this face shield you buy from us. You are protected with our 100% No Questions Asked Guarantee for either a replacement or refund. We care about only putting out high quality products that satisfy your needs. If there is anything you need that we don't offer we go and find the best for you.